A safe and effective malaria vaccine is high on the wish list of most people concerned with global health. Results published on December 26 in PLOS Pathogens suggest how a leading vaccine candidate could be vastly improved. The study, led by Sheetij Dutta, from the Walter Reed Army Institute of Research, USA, and colleagues, focused on a protein called AMA1 needed by the Plasmodium falciparum parasite to invade blood cells and cause disease. Study results suggest that a cocktail of AMA1 proteins from only a few different strains can overcome major limitations of an earlier designed version of AMA1-based vaccines. The challenge with the malaria parasite in general and its AMA1 surface protein in particular is that both exist as multiple strains. 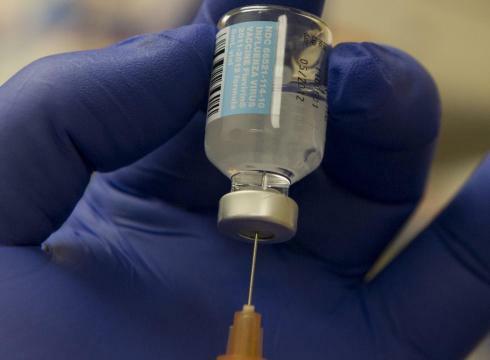 Using AMA1 in a vaccine readies the human immune system for subsequent encounters with the parasite, but when such a vaccine was previously tested in humans, it was effective mostly against one particular P. falciparum strain. To explore the potential for a more broadly protective vaccine, the scientists tested different cocktails of AMA1 from different parasite strains for their ability to elicit a diverse range of antibodies that are active in parasite inhibition assays. They confirmed that a cocktail of AMA1 proteins from three different parasite strains was better than one or two, and one they call Quadvax, which contained AMA1 proteins derived from four different strains, led to an antibody response that was broader than the sum of strain-specific antibodies elicited by the four individual strains. Moreover, Quadvax-elicited antibodies inhibited a range of parasites, including many strains that were different from those in the Quadvax mix. In different laboratory tests, Quadvax-induced antibodies inhibited the growth of 26 different parasite strains, and the scientists suggest that “the combination of four AMA1 variants in Quadvax may be sufficient to overcome global AMA1 diversity”. Besides varying a lot from strain to strain, AMA1 also contains less variable (conserved) exposed parts (so-called epitopes) on its surface. The researchers found that vaccination with Quadvax yielded not only antibodies against the variable epitopes, but also against more conserved epitopes of the AMA1 protein. Such antibodies were not seen when using individual strains for immunization, but Quadvax appeared to enhance the immunogenicity - the ability to provoke an antibody response - of these conserved parts of the protein. Since the epitopes are identical across strains, the resulting antibodies are broadly active rather than strain-specific. The scientists conclude “we had set out to study broadening of antibody responses achieved by mixing AMA1 proteins and were surprised and delighted to find not only greater variety of strain-specific antibodies but also increased antibodies against conserved epitopes were induced by the Quadvax. Perhaps even more exciting, when mixed, combinations of these antibodies were synergistic in their broad inhibition of many parasite strains. Novel conserved epitopes described here can be targets for further improvement of the vaccine. Most importantly, our data strongly supports continued efforts to develop a blood stage vaccine against malaria”. In spite of the extreme variability, a vaccine containing only a few diverse AMA1 strains, the scientists hope, could provide universal coverage by redirecting the immune response towards conserved epitopes. The next steps will be to test human-use formulations of Quadvax in primate models and in a human blood-stage challenge model. Funding: The funders had no role in study design, data collection and analysis, decision to publish, or preparation of the manuscript. Funding for the WRAIR and La Trobe University was provided by PATH Malaria Vaccine Initiative and US Agency for International Development Malaria Vaccine Program. Burnet Institute was funded by Institute National Health and Medical Research Council of Australia; Australian Research Council; and a Victorian State Government Operational Infrastructure Support grant. The NIH studies were supported in part by the Intramural Program of NIAID and the PATH Malaria Vaccine Initiative. Competing Interests: SD has been named on an AMA1 related US patent. This does not alter our adherence to all PLOS policies on sharing data and materials.